What would you do if you knew your child was going to die? I know, you don’t even want to let your mind wander into such a dark, terrible place. But I beg you, just this once, please…please…try and walk in my shoes, if only for the next few minutes. 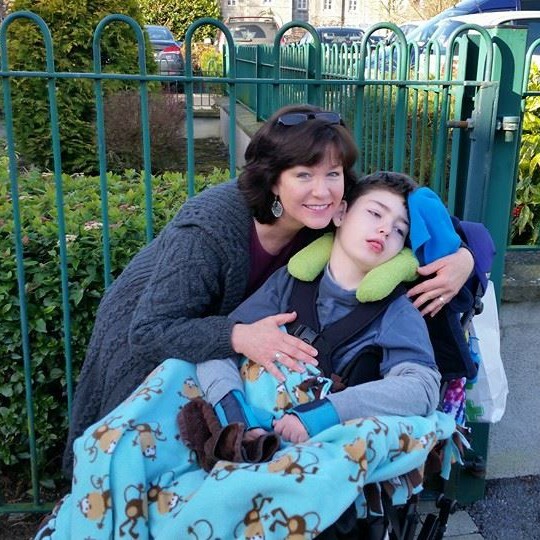 Would you give up the fight for as full a life as possible for your child, or would you make sure that he could do and see everything possible within his ability while he still can? Would you humble (or is it humiliate?) yourself and beg for help to give your child everything they need to make their short life as comfortable, safe and secure as it can be, or would you put your pride and ego in front of your child’s life experience? Would you crumble under the enormity of the impending loss and surrender to the struggle, or would you daily pick up off the floor what remains of yourself and glue those pieces back together, even if only temporarily? Would you let pain and anger blacken your heart, or would you allow love to continue to flow knowing full well how vulnerable you’ve become? who was going to lose their child? Would you slowly drift away in a sea of inability to adjust and cope? Would you turn and run in a sprint to a more ideal and much easier friendship? Or, would you gather round your friend, steadfast and true, through what is sure to be a gut-wrenching journey? I know that one day – 3 years, 3 months, or 3 days, no one knows – I will lose my son Brendan Bjorn. I have come to accept this ugly truth that I utterly abhor with every part of my being. It dawned on me tonight as I watched a video about supporting parents of sick kids, that families like mine with children who are palliative have already lost one thing that those families still have – HOPE. Unlike families who can rightly hold out hope for a cure for their child with cancer, I have the weight of knowing there is zero chance of my son being cured. There is no hope in this regard. And that is what I carry around every single moment on this journey. How I wish that hope still remained, and I envy those families that still have it. This is one hell of a hard journey, and it is not for the weak of heart. I have lost friends and partners along the way. I have lost my home, my own good health, my career, my financial stability and any hope of a secure retirement. But, I will continue to fight for what my son needs in order to have as full a life experience as he possibly can in the unknown amount of time I am blessed to have him. And yes, to answer one of the questions above, I will humble and humiliate myself, if that is necessary, to give my son what he needs, for he is worthy of more happiness than most people I know. He is pure and good and innocent and whole in ways that the world rarely understands. As for crumbling under the enormity of this all, yes, I do…and then I slowly pick up the pieces of me that remain and I attempt to put them back together again. Another hour, another day, another week, another year, and I continue on because I must, for him, keep it together. I have pain and anger and my heart is fleetingly blackened, but at the end of the day, love flows enough to give me the strength to carry on. While it leaves me vulnerable to more pain, it also leaves me open to soak in all that this journey has to offer. Tracy, before I send you my reply, I wanted to be sure you are getting email responses to your website this way. I know how you feel and want to respond, but want to make sure I’m responding the correct way. Please email me back and let me know we are communicating. I admire your guts, determination and unconditional love for your two boys. I wish you would get all the practical, financial and emotional support, you so deserve.